While the pond in Smith Park on Troy Road in Delaware was snow covered on Tuesday, it wasn’t completely frozen over. The city prevents such an occurrence from happening in ponds located in its parks system through the use of bubblers. Even if city-owned ponds were allowed to freeze over, skating on them could result a misdemeanor trespassing charge. With frigid temperatures having turned bodies of water throughout Delaware County into sheets of ice, individuals tempted by the cold weather to lace up their ice or hockey skates and test a nearby icy surface may want to rethink that idea, especially if it’s located on public property. Within the City of Delaware there are several ponds scattered throughout the parks system that residents are advised to stay out of or off of no matter the season. These ponds are located at Blue Limestone Park, Smith Park, Cheshire Park, and Veterans Park. “If parks staff or a police officer were to see someone skating on a city pond or playing close to a city pond, that person would be asked to get off of the ice or leave that area,” Community Affairs Coordinator Lee Yoakum said. Individuals who fail to cooperate could be charged with misdemeanor trespassing, although the Delaware Police Department hasn’t issued such a charge in recent memory, according to Chief Bruce Pijanowski. 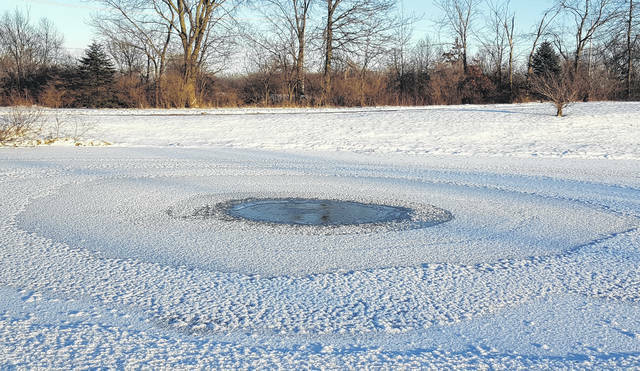 In addition to possibly facing a trespassing charge for taking to the ice in city-owned ponds, Yoakum said the ponds aren’t an ideal location for such recreational activity since the water is far from being completely frozen over despite the recent Arctic-like temperatures. As for skating on ponds located in housing developments across the city, Yoakum said any restrictions are left up to the property owners or homeowners associations since they lie on private property. “Our best recommendation is that skaters travel a few miles up U.S. Route 23 to Delaware State Park, which offers a public ice skating option,” he said. According to the Codified Ordinances of the City of Powell, using a city-owned pond for ice skating purposes is prohibited, unless otherwise noted. Any individual who pleads guilty to or is convicted of violating section 955.10 is guilty of a misdemeanor of the first degree, according to city law. Megan Canavan, director of communications, said two city parks — Meadowview Park and Village Green Park — contain ponds. In the past two weeks, she added, the Powell Police Department has received three phone calls regarding people ice skating on ponds. While Powell has its own law regarding ice skating on city-owned property, privately-owned ponds are fair game for ice skating purposes if allowed by the landowner. “The police department can issue a criminal trespass warning for the property owner, if requested,” Canavan said. Preservation Parks of Delaware County offers visitors numerous ways to enjoy nature. However, skating on one of the various ponds scattered throughout its nine parks isn’t one of them. “We don’t have any designated areas for ice skating,” said Sue Hagan, marketing and communications manager for Preservation Parks.